Drumglass Boys National School, Dungannon, has the honour of being represented by 36 of its �old boys� on active service. 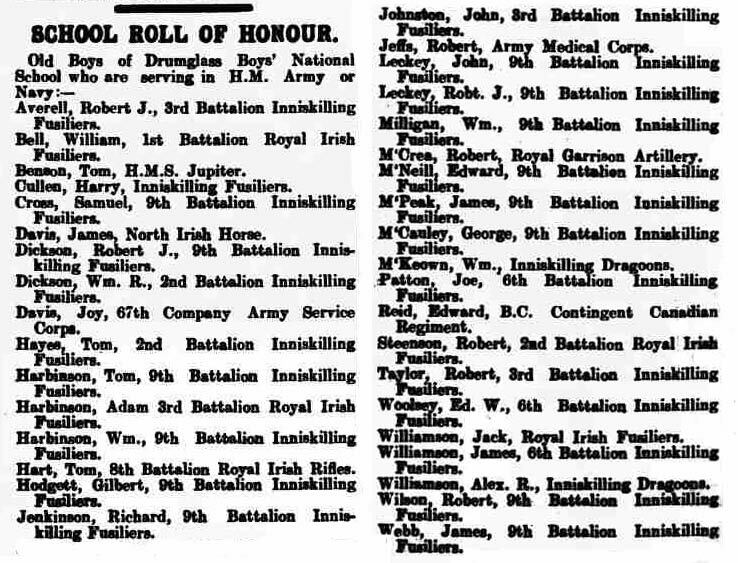 These are scattered over the Inniskilling Dragoons, the North Irish Horse, Royal Garrison Artillery, Army Service Corps, Army Medical Corps, Inniskilling Fusiliers, Royal Irish Rifles and Royal Irish Fusiliers, while on boy is serving on HMS Jupiter. Seaman Thomas Benson, A.B., H.M.S. Jupiter, (younger son of Mr Robert Benson, Dungannon), has obtained the Russian Order of St Stanislaus for his exertions in common with other members of the crew in rescuing a liner laden with munitions for Russia, which had been caught in the ice.